Modern Casting the official publication of the American Foundry Society, and serves the needs of the Corporate and Individual Members of AFS and other metal casting industry professionals. 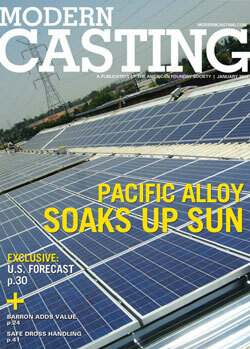 The total average circulation is more than 15,000 MODERN CASTING readers in North America, including nonmembers of AFS. Readers consist of plant owners, CEO's, vice presidents, operations and purchasing managers, process and design engineers and plant managers. The magazine reaches virtually every custom and captive metal casting facility in the U.S., Canada and Mexico, with additional distribution in more than 30 countries.